I think what kept me reading The Black Coats is how Oakes discusses justice. Because I feel like there has to be that moment of doubt, where you feel wronged, and just want retribution. And if we had the chance, would we take it? And would that truly be justice? The Black Coats is a story about friendship, revenge, and forgiveness. It’s a story born from trauma, from injustice, and from needing to stand up against the constant onslaught. But it’s also a story about recognizing the difference between vigilantism and justice, about seeing through what we have been taught, and about realizing who we really are. The Black Coats exposes this raw part of ourselves. When we question if justice has been served, and when we feel cheated of fairness. And it asks us, truly and honestly, what we might do if we were confronted with a way to right the wrong. The Black Coats shocked me from the beginning. I knew that this book was going to be about vengeance. About punishing those whose lives barely suffer a scratch, yet whose victims live forever scarred. And thus The Black Coats is born. Thea enters the story after the murder of her cousin and suffering through the pains of grief. She walks aimlessly and The Black Coats give her a chance to feel alive, to feel like what she is doing could make a difference. And thus is motivated by the pursuit of justice for her cousin, which has lost the attention of the media. Thea, and her cousin Natalie, are also black teens. So the idea that the media would not pursue the justice for Natalie makes a lot of sense. And the stakes for Thea’s pursuit rises, as she herself remarks, when she contemplates her mission regarding a white man in Texas. But The Black Coats are motivated by justice. It isn’t about unrestrained violence, or death, or taking matters into their own hands. There’s a very strict set of codes, training, and organization behind their doors. Or is there? Over the course of the book, Thea has to figure out if she is on a quest for justice or vengeance, and if she doesn’t know which, maybe The Black Coats don’t either. Throughout the book, Thea has to search within herself for not only her true motivations, but also for what justice means. What moved me the most about Thea’s story is the idea that perhaps enacting the same punishment onto someone else, doesn’t actually heal anyone. A scar upon a scar does not remove the scar, the memory, or the nightmares. That there is power in forgiveness, in having to live with the pain. Yes there are exceptions, of people without remorse, or guilt, but there are exceptions on both sides. 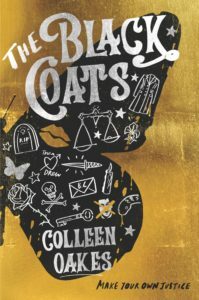 The Black Coats is a book that seek to explore the very definition of justice. Are their actions right? What is justice and is there ever a time to enact your version of justice outside the system? When the system is so corrupt, when it’s biased against you because of your appearance, when it won’t listen to you. These are questions that Oakes only begins to answer, to probe, and The Black Coats is a great read for anyone who also wants to dive deeper. Find The Black Coats on Goodreads, Amazon, Indiebound & The Book Depository. If you liked the idea of this book, I’d also check out The Hollow Girl! What is your favorite book with secret societies?